Survivalon® jackets and vests are windproof & water repellent with excellent breathability due to the 100% cotton construction. Our Classic Fit Jackets/Vests at a medium measure 33.5" in length and are designed for men who enjoy a full cut and like to wear their jacket/vest over a suit jacket or sport coat. Our Cagney Jackets/Vests at a medium measure 30.5” in length and run shorter than our Classic Fit. For men who prefer or need a shorter coat this works perfectly. Full compliment of pockets on the shell and interior. Pockets for just about everything that you need when traveling. Perfect for moderate to warmer times of the year and Southern areas. When traveling the lightweight unlined jacket is easily packable in your suitcase. Where should I wear a vest? Vests are good in warm weather with anything from a tee to woven and knitted shirts and cotton sweaters. In cooler and cold weather, vests are worn with heavier cotton or woolen sweaters. What is the difference between waterproof and water repellant? 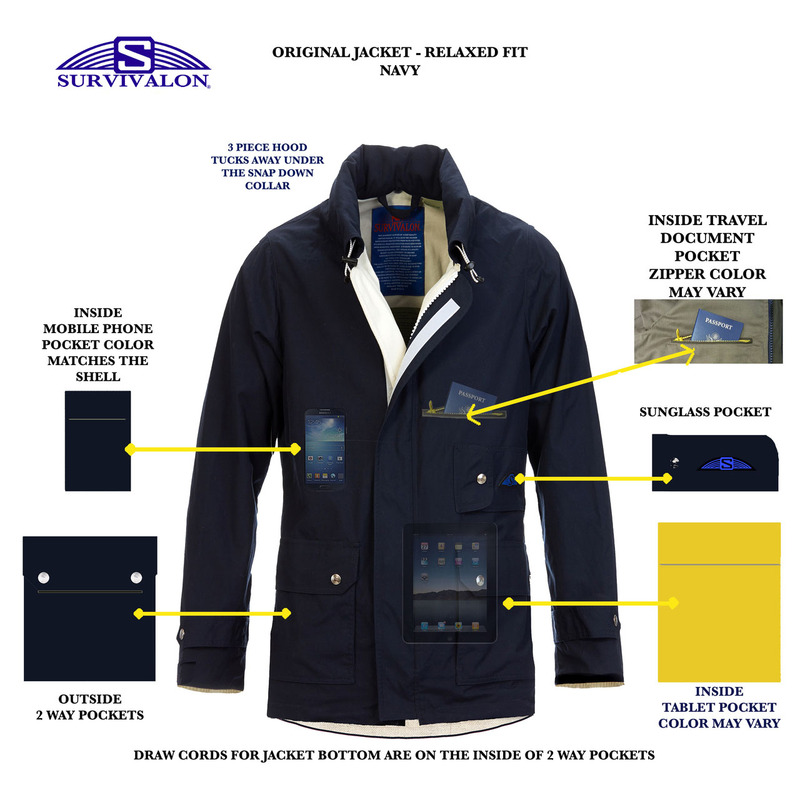 Survivalon® is a 100% cotton breathable fabric that is treated on the face with silicone, making it water repellent. Waterproof fabrics are synthetic and are treated with synthetic coatings on the face or the underside and sometimes both with “breathable” coatings. All cotton - breathes naturally. Over time the all-cotton shell and liner soften and form a patina as a pair of jeans. Our jackets and vests are made of only the finest materials available, making them comfortable, breathable, water-repellent, and windproof. Shell and liner are both 100% cotton; Like your favorite pair of jeans, your jacket or vest will age beautifully with regular wear and will come to bear a finish similar to that of distressed denim. Suggested cleaning: Dry clean and reproof with a waterproofing spray, or machine wash with a mild detergent. Tumble dry on low, or hang dry. Respray when completely dry. Many hours have gone into the engineering of each SURVIVALON piece, because we at SURVIVALON believe in quality.